TiltShift photography is a great way of taking big pictures that look like little toy villages. One small area in focus with the rest appearing to be at a far different depth. Just like if you where standing over a little model of a big town model. There are many iPhone apps to help take TiltShift effect images and even more that will let you edit a photo to add the effect later. Lately, there has been a few really fun videos on popular video sharing sites using that same TiltShift effect. The effect is great for a video of a train moving in the distance, or people walking around town. One I really enjoyed was a video from a cliff overlooking the ocean as a ship goes by… give it a try! 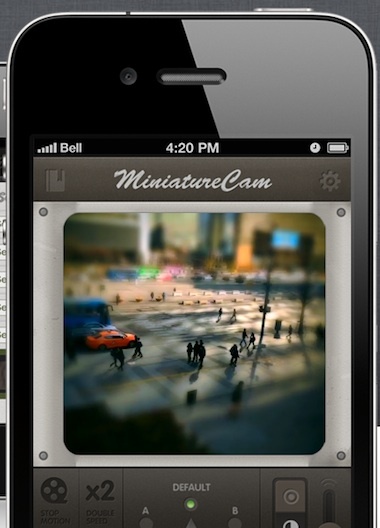 If it sound like fun, then you may want to take a look at a free app I found, MiniatureCam. A video app that shows the effect applied as you record. No mystery if your getting the video you where hoping for. For a bit of extra impact, the speed of recording can also be controlled in MiniatureCam. This gives a less smooth movement of characters in your video to add to the ‘toy’ effect.